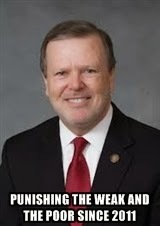 If you were a mortgage borrower in North Carolina who got a "write-down" reduction on your mortgage, because the lending bank used out-right trickery and other abuses, then a provision in the gas-tax-hike bill the NC Senate just passed will treat that "write-down" as earned income. Someone who got a $20,000 reduction on his or her mortgage would suddenly owe another $1,160 in state taxes for the year. So that's what the Republicans have been doing in Raleigh to deal with their $200 million budget hole! But that's not all that's in the NC Senate's gas-tax-hike bill. "Another provision of the bill would end the state income tax deduction for tuition expenses," which means those little liberal communist college students, who also think they should get to vote in the state's elections, will get their own special tax hike, so take that, queers!